John Ferguson is an electronic musician. His work is inspired by notions of instability, and focuses on tactile approaches to the live manipulation of audio/visual materials. Predicated on listening and real-time (re)negotiation, his combinations of hacked electronics, wireless gaming controllers and custom software/mechanical systems are frequently loud and exuberant. But the resistance inherent within these instrumental ecologies significantly affects the compositional process, raising issues of causality, agency and legibility, whilst foregrounding ambiguity as an alternative to functionalism in interface design. 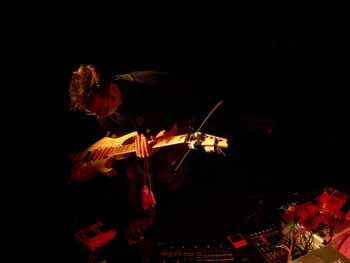 John is active as one half of the Tron Lennon improvisation duo (with Paul Bell), involved in multiple collaborative projects with Bennett Hogg, and has shared the stage with Atau Tanaka, Robert van Heumen, Gwilly Edmondez, Graeme Wilson, John Ayers, Mat Postle, Bill Thompson, Adam Parkinson and Will Schrimshaw. He is currently a PhD candidate in Music based at Culture Lab, Newcastle University (UK), where he is writing his thesis and teaching on various undergraduate modules. He recently completed a short European tour culminating at Club Maria in Berlin where his work with Tron Lennon was nominated for the Transmediale award 2008. Through this project he has also contributed to the Leonardo Electronic Almanac (Vol. 15), Fool’s Gold (Edinburgh College of Art: Issue 1) and Soundmuseum.fm.